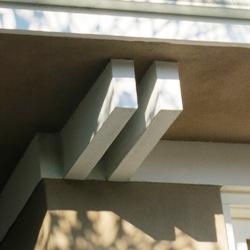 A corbel is a type of support. It projects out from a wall and carries a load above it. It is often used as part of the roof support. A corbel can be as simple as a projecting beam, or it can be richly carved and ornate. A corbel is keyed into the structure. It is built into the structure, or in some way pinned or secured to the structure. On the other end it projects out and supports a load. In residential architecture this is usually the eave of a roof. Corbelling can be a very useful tool for an architect or builder. If you are supporting something very heavy, corbelling can allow you to provide extra support where it is needed while keeping basic structure relatively light. Corbels can built one on top of another to create a complex bracket, either as a means of extending the reach, or for decorative effect. The ones to the right are from a Craftsman home and are grossly in excess of what is needed for this light roof. 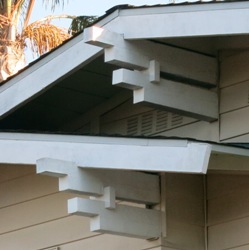 The inspiration for this type of Corbel was traditional Japanese architecture that used such supports to carry much heavier roofs. In some cases a row of corbels would be created to allow a wall of an upper story to project out from a building. Such a row is called a corbel table. It can be as simple as a string course of bricks, or multiple strings, cantilevering out from the wall. 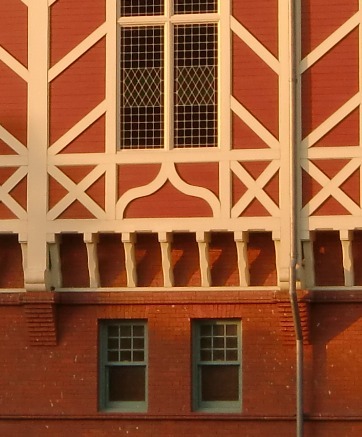 This photo shows the support details from a Tudor building at Gallaudet college, where a second floor extends out over the first floor. The bricks under the vertical posts are corbelled out one course at a time until they extend out far enough that the beams can rest on the bricks. Likewise these carved corbels appear to rest on the bricks, which means they aren't actually tied into the structure and provide minimal support. This type of corbel is referred to as a console. These consoles are on an Italianate home. One of the identifying features of an Italianate style home is the use of carved consoles and corbels under the eaves. 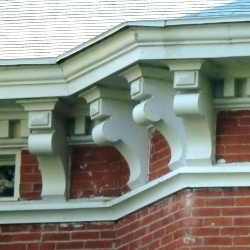 Pairings of corbels were often used on Italianate style homes. In many cases their use was purely decorative. Probably most uses of corbelling in residential architecture is decorative rather than functional.